Women of Western Countries change their lovers and husbands hundred times a day, it editorially says. Women need to be whipped to understand how precious is their IJJAT (chastity), says Sunday’s editorial column of the Samaja that had allowed itself to be used recently as the propaganda platform of Hindu chauvinist Praveen Togadia and a few months earlier had tried to whip up communal acrimony between the Hindus and the Muslims to create communal polarization before the municipal elections, for benefit of Hindu fundamentalists in Hindu dominated urban areas. At the center of its motivation to pen and publish this obnoxious editorial lies an instance of suicide by a minor girl as her IJJAT was looted by a LAMPAT (satyr) who entrapped the victim through postings in social media: Facebook. It has rained abuses on the social media while trying to convince the readers that because of social media many societal offenses are taking place. The social-mediascape has become the grave yard of social values and sexual disciplines, if what it has said is material to put credence to. It has reached the zenith of its mischief by informing its readers that evolution of social media like Facebook and Twitter has its root in the western culture wherein “women change their lovers and husbands a hundred times everyday”. It has justified the suicidal death of the sexually exploited unmarried girl, who made sacrifices of her IJJAT being entrapped in the Facebook, by a man in guise of love. “What other way than suicide was available to her?” it has asked, when, unlike western culture that stands for women changing their lovers and husbands a hundred time everyday, India stands for chastity that she did away with. 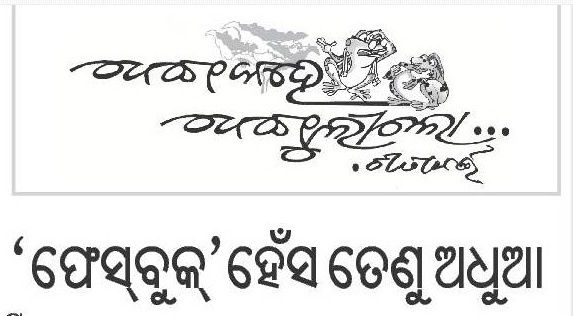 Where from the Samaja has got the data that in western countries “women change their lovers and husbands hundred times a day” is not revealed in the said editorial column. But, misogyny so shamelessly displayed therein is certainly an affront to ethics of journalism adopted in India. Neither ancient nor modern views in editorial. Chandi-path read during Navaratri explains difference between Indian and Asura views of wife. Asura king described wife only as property, while Durga stated that wife should be equal to husband. स्त्रीरत्नभूतां त्वां देवि लोके मन्यामहे वयम्। सा त्वमस्मानुपागच्छ यतो रत्नभुजो वाय्म्॥११२॥ = Message of king Shumbha-I have all the jewels except precious jewel like you. (दुर्गा) यो मां जयति संग्रामे यो मे दर्पं व्यपोहति। यो मे प्रतिबलो लोके स मे भर्ता भविष्यति॥१२०॥ = Reply by Durga-Only that person can be my husband who is equal to me. Only difference is that husband remains in his family, but wife is part f another family after marriage. Another difference is that only wife can give birth and nurture the issue. So 4 roles of wife have been described in Vedas-One word is used only in Oriya and another in old Arabic, now used only in Kenya & Tanzania. This was later interpreted as rule of 4 wives in Koran. These roles are called-(1) Mahishi = mother & wife, (2) Bawata (Old Arabic) = Head of house, (3) Pala-gali = link between 2 Palas of father & husband family, (4) Parivrikta = Independent personality as woman, teacher or any other professional. ” BLOODY NONSENSE – the editorial “. The person who made such comments without having proper knowledge,not suitable to be an editor in the first place.